Following the SPL's decision to allow safe standing sections, what options are available to clubs? Scottish Premier League clubs have been given the green light to introduce safe standing sections at their stadiums. Teams can now ask the SPL board to sanction a standing area at their ground, subject to further approval from the police and local authorities. But just how different would the new areas be compared to the terracing of yesteryear? Does this mean a return to old-style terracing? No. The league’s chief executive, Neil Doncaster, says a particular form of safe standing currently used by eight top flight teams in Germany, known as rail seats, will be the permitted form of new-style terracing. How do rail seats work? Rail seats replace the current plastic seating in stadiums, with each chair having a high back which serves as a rail. Each seat folds up and is locked, with clubs able to unlock each chair when an all-seater arena is required, for example in European matches. 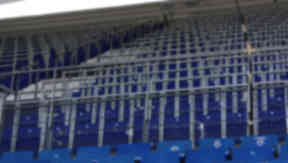 At present, one rail seat costs 100 euros (£84), compared to around £30 for each plastic seat currently used at grounds. One argument made in favour of rail seats is the long-term cost benefit. Current plastic seating is prone to damage and may need replaced over time, whereas rail seating is seen as more durable. Although there is provision in some German grounds for two fans to stand for each rail seat, owing to there being two steps between each seat, the SPL’s chief executive says the pilot scheme will see one supporter occupy each rail seat space. Are rail seats already used? To comply with UEFA regulations in 2000, German clubs had to find an option to both satisfy the requirements of the governing body but also continue to meet their own supporters’ desire to stand at games. Hannover 96, Werder Bremen, Stuttgart, Hoffenheim, Wolfsburg, Bayer Leverkusen and Hamburg all subsequently installed rail seats installed in their grounds. At Hoffenheim’s Rhein-Neckar-Arena, which opened in 2009, 9,150 places in the 30,150 capacity stadium are reserved for standing. “The Germans believe standing is the natural way to watch football,” Jon Darch of the Safe Standing Roadshow told STV. Although argument rages over whether any form of standing can be completely safe as opposed to seating, those in favour of the technology insist there is no evidence to argue the use of rail seats is more dangerous or safer than seating. What if my team plays in European competition? To comply with UEFA guidelines on all-seater grounds in the Champions League and Europa League, each rail seat can be unlocked by stadium staff prior to games to create a folding chair, removing the standing section without affecting the overall capacity. Can they be installed in every stadium? Cost aside, the installation of rail seats largely depends on the gradient of the stand in which they are being installed. 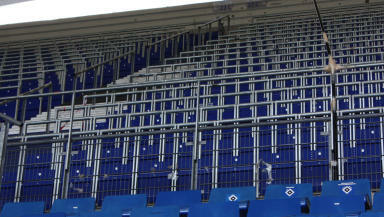 In German grounds, some clubs use two step rail seats on lower tiers but, due to a steeper gradient, upper tiers are normally resticted to one occupant. Are there any clubs interested? Celtic themselves have viewed the option, having been visited by the Safe Standing Roadshow as part of the club’s own feasibility study. Are there Scottish clubs opposed to the plans? St Mirren chairman Stewart Gilmour doesn't believe his own team's ground, opened in 2009, is built for safe standing. "Our ground is specifically designed for seating and the actual heights of the concourses are for seats," he told STV. "They are not for standing. If you stand they will catch you on the knees and it is dangerous." When might it be in operation? "Potentially we can receive applications from the word go so in theory it could start as early as next season," SPL chief executive Doncaster said. "But it's really up to the clubs. Our rules currently say that no safe-standing is allowed in SPL stadia, so that is at least one hurdle removed. Would the SPL’s promotion criteria over capacity change? No. Every member club of the SPL would still require to have 6,000 seats to participate in the competition. The introduction of a safe standing section would be in addition to the capacity.